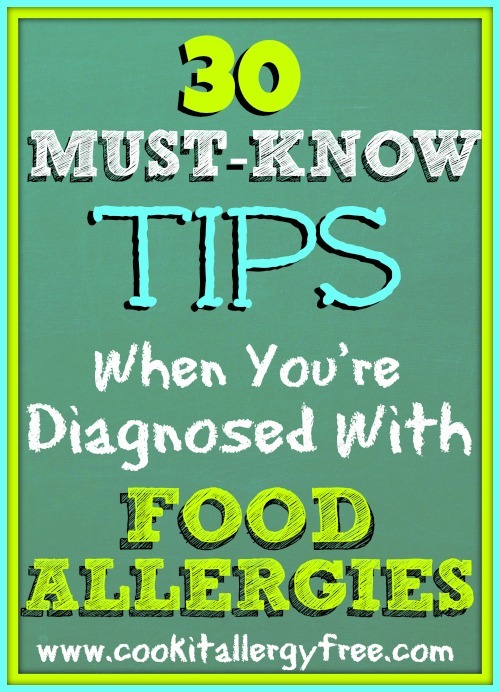 30 Ways to Rock Your New Food Allergy Diagnosis with Confidence!! All I know from our family’s own past experience, and now from the endless number of families I work with in my Food Allergy Consulting, there are some very universal sentiments and feelings upon that initial diagnosis that everyone seems to go through. “Overwhelm” with all the information to go through and labels to read. “Anxiety” about the possibility of cross-contamination. “Confusion” about what is and what isn’t safe. “Wonder” about what is left to eat anymore. You will get more confident about handling everything as you go through different experiences. You will amaze yourself at how much you can learn. You will be shocked at how many healthy amazing super foods you CAN eat. You can do this (I know I said this, but you may need reminding for this one). And like I said… I promise. And a bonus is that with all of the label reading you will be doing, you are also going to learn a lot about what goes into those processed packaged foods. It will open your eyes to many things about our food industry and will probably put you on an entirely new path to health! Below is a list of mantras and tips that are very helpful to keep you going as you are traveling through the emotions of that new food allergy diagnosis. Print them off and read them daily. I know you are going to be so proud of yourself as you learn to handle different situations and experiences with a growing confidence and grace. Be kind to yourself. You will make mistakes. Forgive yourself. Every mistake will be an incredible (and perhaps, scary and memorable) learning opportunity. Be patient. You will not master how to handle everything overnight. But every day you will learn more than the day before. Read labels on everything, every time. Even if you know a product well, they can change their ingredient formulations without notice. Become a food detective. Make it fun. Go on a hunt for those hidden allergens. Be your (or your child’s) BEST advocate. Look for local in-person or online communities. Having the support of others going through the same thing will be a huge comfort as you share emotions, ideas, recipes, and friendship. Spend a lot of time on Pinterest and follow me there. There are great Food Allergy Boards there that are packed with awesome ideas and recipes from incredible Food Allergy bloggers to get you through ANY occasion. Branch out and try to cook new things. You may surprise yourself. See #9 for a good spot to find these new recipes. Do not be afraid to ask for help. Reach out for support. Eat Clean and Unprocessed foods like those on this list of 70+Allergy-Friendly Super Foods. There are no labels to read. No cross-contamination to worry about. Focus on all of the things that you CAN eat…do not focus on what you cannot! See #12 for that reminder list of how many things are left. Remind yourself about how much healthier you and your family will be by focusing on all of these whole, pure Allergy Friendly foods! Remember that list from #12?? Get some fun transportable lunchboxes and food containers. Speaking of stashes, keep one with your favorite Allergy Friendly cupcakes and cookies in the freezer. You’ll be all set to pull them out whenever you have a birthday party or special occasion to go to. Begin a recipe collection of some of your favorite and most successful Allergy-friendly creations. Remember #9? Pinterest really is a great place to keep your favorites easily accessible. Join and make some boards of your own! Keep up with and follow some of my favorite Allergy-Friendly Food bloggers and advocates out there. Use technology to your advantage – there are so many Food Allergy apps available to help you manage your food allergies, including my Cook It Allergy Free App. Learn how to read the long words in ingredient list. Understand the no-nos to your allergy and become very familiar with the different forms that those ingredients can show up as. There are also apps for this to help you. Look at this as an adventure. Perhaps a somewhat wild one, but an adventure that will make you stronger, none-the-less. If you need it, have someone help you shop. Keep counter wipes with you all the time – wipe down your own counters, restaurant surfaces, school tables, etc. to avoid cross-contamination. Help your kids find a food allergy buddy, if possible. As adults we can seek out online or in-person support groups, but children may feel alone if they are the ones that are dealing with the food allergies. NEVER EVER feel like you are inconveniencing anyone. This is your health (or your child’s) and there is nothing more important and is nothing you need to apologize for. Always remember #7. Seek out Allergy-friendly restaurants. Do research. Find out how well certain restaurants handle food allergies from other food allergy families on the Allergy Eats App. Take the time to call ahead to the restaurants before you go. Call in the off hours when they are hopefully not as busy and ask to speak to a manager so they are prepared before you arrive. Stock up on useful resources. The Food Allergy Party Kit is a great tool to help you get through those different social gatherings, school parties, potlucks, etc. If it is your child that has the food allergies, set an example for them. They will ALWAYS sense your stress so let them feel that you are in control and that you can handle this. They will begin to feel the same. Our children model our behavior. So…like I said above. Print these out. Read them every day. Please make your app available for Android.